(Nanowerk News) Discovered in 1948, Casimir forces are complicated quantum forces that affect only objects that are very, very close together. They’re so subtle that for most of the 60-odd years since their discovery, engineers have safely ignored them. But in the age of tiny electromechanical devices like the accelerometers in the iPhone or the micromirrors in digital projectors, Casimir forces have emerged as troublemakers, since they can cause micromachines’ tiny moving parts to stick together. MIT researchers have developed a powerful new tool for calculating the effects of Casimir forces, with ramifications for both basic physics and the design of microelectromechanical systems (MEMS). One of the researchers’ most recent discoveries using the new tool was a way to arrange tiny objects so that the ordinarily attractive Casimir forces become repulsive. If engineers can design MEMS so that the Casimir forces actually prevent their moving parts from sticking together — rather than causing them to stick — it could cut down substantially on the failure rate of existing MEMS. It could also help enable new, affordable MEMS devices, like tiny medical or scientific sensors, or microfluidics devices that enable hundreds of chemical or biological experiments to be performed in parallel. Quantum mechanics has bequeathed a very weird picture of the universe to modern physicists. One of its features is a cadre of new subatomic particles that are constantly flashing in and out of existence in an almost undetectably short span of time. (The Higgs boson, a theoretically predicted particle that the Large Hadron Collider in Switzerland is trying to detect for the first time, is expected to appear for only a few sextillionths of a second.) There are so many of these transient particles in space — even in a vacuum — moving in so many different directions that the forces they exert generally balance each other out. For most purposes, the particles can be ignored. But when objects get very close together, there’s little room for particles to flash into existence between them. Consequently, there are fewer transient particles in between the objects to offset the forces exerted by the transient particles around them, and the difference in pressure ends up pushing the objects toward each other. 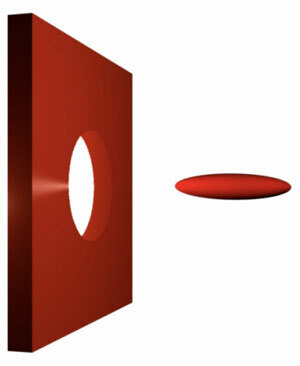 In the 1960s, physicists developed a mathematical formula that, in principle, describes the effects of Casimir forces on any number of tiny objects, with any shape. But in the vast majority of cases, that formula remained impossibly hard to solve. “People think that if you have a formula, then you can evaluate it. That’s not true at all,” says Steven Johnson, an associate professor of applied mathematics, who helped develop the new tools. “There was a formula that was written down by Einstein that describes gravity. They still don’t know what all the consequences of this formula are.” For decades, the formula for Casimir forces was in the same boat. Physicists could solve it for only a small number of cases, such as that of two parallel plates. Then, in 2006, came a breakthrough: MIT Professor of Physics Mehran Kardar demonstrated a way to solve the formula for a plate and a cylinder. In a paper appearing this week in Proceedings of the National Academies of Sciences, Johnson, physics PhD students Alexander McCauley and Alejandro Rodriguez (the paper’s lead author), and John Joannopoulos, the Francis Wright Davis Professor of Physics, describe a way to solve Casimir-force equations for any number of objects, with any conceivable shape. The researchers’ insight is that the effects of Casimir forces on objects 100 nanometers apart can be precisely modeled using objects 100,000 times as big, 100,000 times as far apart, immersed in a fluid that conducts electricity. Instead of calculating the forces exerted by tiny particles flashing into existence around the tiny objects, the researchers calculate the strength of an electromagnetic field at various points around the much larger ones. In their paper, they prove that these computations are mathematically equivalent. For objects with odd shapes, calculating electromagnetic-field strength in a conducting fluid is still fairly complicated. But it’s eminently feasible using off-the-shelf engineering software. Since Casimir forces can cause the moving parts of MEMS to stick together, Dalvit says, “One of the holy grails in Casimir physics is to find geometries where you can get repulsion” rather than attraction. And that’s exactly what the new techniques allowed the MIT researchers to do. In a separate paper published in March, physicist Michael Levin of Harvard University’s Society of Fellows, together with the MIT researchers, described the first arrangement of materials that enable Casimir forces to cause repulsion in a vacuum. Dalvit points out, however, that physicists using the new technique must still rely on intuition when devising systems of tiny objects with useful properties. “Once you have an intuition of what geometries will cause repulsion, then the [technique] can tell you whether there is repulsion or not,” Dalvit says. But by themselves, the tools cannot identify geometries that cause repulsion.